The Aston Brook Garage or "Look at that Bike up there Mom"! A brief look at the life of a true "Astonian". 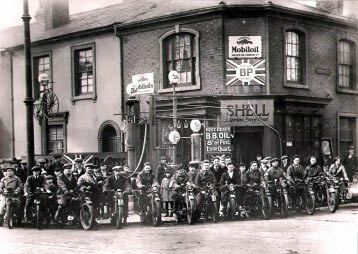 Moss Gear Cycle Group outside the filling station c 1925. Uncle Joe Davies is 5th from left in light coloured cow gown. His wife is on the motor cycle at extreme right of photograph. You can just see the swing out petrol pumps behind the group. Look at the oil prices by the pumps. How often, when walking along Aston Road North, near to its junction with Dartmouth Street did we hear some young child echo those comments? We are of course, talking before the Aston Expressway caused the demise of that particular area. They were of course talking about the Aston Brook Garage, situated in Aston Road North on the corner of Powell Street. Above the main entrance of the premises was a "Boneshaker" cycle. This was a well-known focal point for all, either resident in the area or those passing through. But how did it come to be there? To find the answer to that, a very interesting story must be told about a remarkable lady, a true native of Aston, who with her determination and hard work brought about a change to the area and helped local residents, less fortunate than her, to benefit from her charitable actions. Florence (Flo) Laura Moseley, Nee Kenning, was born January 11th 1914 at 3 Sycamore Road, Aston to Thomas and Laura Kenning. She was the oldest of 10 children. Sadly only 6 would survive. She attended Vicarage Road School leaving at the age of 14 years. The next job was with the local HP Sauce Company, as a machine operator. She remembers that when she was carrying out the task of fixing labels to the bottles, this had to be done by hand. Every so often, the forewoman would come and inspect the work. Flo would have to stand to attention whilst the inspection was carried out. On one such occasion she had to remove 50 labels and replace them because they were not correctly applied. Though not funny at the time, on one occasion a sauce vat overflowed leaving her stood up to her knees in sauce. It would seem many days passed and many washings took place before the smell of sauce went away. Flo remembers that tea chests were used for carriage of the finished goods from HP. These would arrive at the premises from the railway. They would often still be full of straw that was both wet and more often than not, contained mice and other vermin. A surprise was waiting in every case! In 1937 Flo married Ernest Moseley at Aston Parish Church. They would later have one son, Keith. Joe Davies was Flo's uncle on her mother's side of the family. 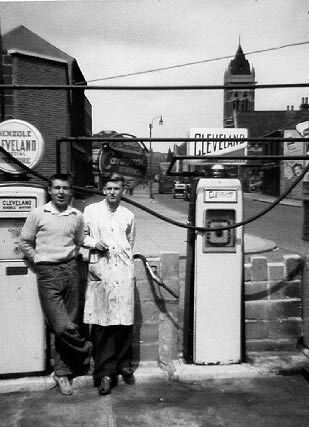 He had a small petrol filling station on the corner of Aston Road North and Powell Street. He had been here many years. It is believed that it was the very first in the area. One day in 1947, Flo's mother asked her if she would go and help Uncle Joe because things, "were not going too well" It should be made clear that at this time Flo did not know Uncle Joe very well and had no experience or knowledge of work in a filling station environment. When she arrived she asked herself, "what have a let myself in for" The place was at the very least a shambles, at worst, a disaster waiting to happen. Never the less, being a strong willed and determined person Flo went to work. The whole of the premises was cluttered with every conceivable piece of metal junk. There were old Mangles, wooden trailers, some of which Joe had made and not sold, axles, anything made of metal he had hoarded. Flo later learned that local people, far from thinking it was a filling station, thought it was a scrap metal yard. Apparently, Joe thought, "Muck and metal was money". The petrol pumps, which were of the old swing out type, were situated on the shops forecourt, so they could swing out to accommodate the vehicles, which pulled into the kerb for filling. Flo remembers at night these had to covered and secured, a task which usually took up to 20 minutes to accomplish. Invariably as they were being covered someone would arrive requesting petrol. There were a total of three pumps for petrol and one for diesel. The task of uncovering these pumps was an horrendous task on cold mornings when the metal of the pumps took on a level of cold that had to be experienced to be believed. As Joe was often attending to other ventures Flo would perfrom the tasks on her own. This would include rolling out five-gallon drums of oil. The supplying of petrol and oil to vehicles at this time, was of course carried out by filling station staff. No self service in those days. Flo would also be expected to check and correct tyre pressures, where necessary. Later, whenever it was announced that prices were about to rise, queues of vehicles would stretch into nearby streets waiting to be filled. On her first day working at the filling station, Flo sold only 10 gallons of petrol. By the time she came to leave the premises years later, she would be selling 6000 gallons at peak times. She very quickly realised that due to Joes' other ventures she would be running the station on her own. Of her own volition she commenced to get rid of all that old metal and other rubbish that abounded in the premises. She was determined to make them more, user friendly. In accomplishing this task she fell out many times with Joe. His argument was, " I might make few bob from that". He soon saw the positive side. "If I ever see another petrol cap!!!" A more pressing need to clear the premises was that the petrol delivery drivers were refusing to deliver due to them having to negotiate, every time they came, a way to fill the petrol tanks. Using her communication skills to their best advantage, Flo coerced Hayward & Cook, a local Scrap Metal Merchant, from Aston Road North, to take it all away. She was then able to liaise with the petrol company and iron out all the difficulties that had arisen under Uncle Joe's management style. Petrol was now going to be delivered. The capacity of the tanks at this time was 1x 300-gallon tank and 2x 200 gallon. They were situated under the filling station forecourt. Because these tanks were so small, Flo had to pay an extra premium on all the petrol she bought. Flo very quickly got to grips with running the station. She found it very hard but rewarding work. Being a good businesswoman she established contracts for the regular supply of petrol with Steelhouse Lane Police Station, Eastwoods Scrap Metal Merchants, Whitehouse Street. 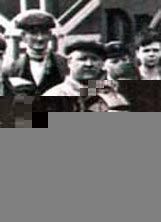 Edgar Vaughan, Bagot Street, Rogers the Printers, Aston Road North. Drews the Bookmakers, Aston Road, Aston Autos Aston Road, Piccioni, Marble Merchants, Phillips Street, just to mention a few of the 50 contracts she set up. Mr Piccioni was actually a member of the Italian Consulate. Running the filling station was not without incident. Once Flo was at the premises with her back to the pumps. She was talking to her son's mother in law Jessie Sturm. Now Jessie was a very laid back person, who was never very demonstrative. As they stood talking Jessie said, "Your pumps are on fire" Because she had said this rather quietly and without emotion it did not register immediately with Flo. One she did realise what had been said she attacked the fire with the fire extinguisher at hand and put out the flames, which had been near to engulfing the whole station. The fire brigade arrived, having been contacted by locals and asked why she had tackled it on her own. Flo stated that she knew a lot of the local children were nearby and had the station gone up, lives may have been lost. 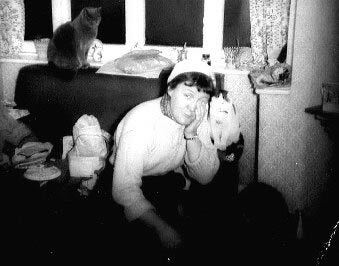 Another incident arose after Flo got a little too near to a paraffin stove. Her clothes and boots came into contact with the petrol she had been dispensing and caught fire, enveloping her in flames. As she was on her own, she grabbed a foam fire extinguisher and turned it on herself putting out the flames. Being somewhat exhausted she did not have the energy to turn off the extinguisher, which continued to dispense the foam. Her husband arrived a few moments later and could not see Flo as she was under the big mound of foam! Very lucky and safe! Around 1960 Uncle Joe passed away. Flo inherited the garage in her uncle's will and so set about modernising the premises. The old frontage was removed and replaced by a large plate glass window. A large door was at the corner. It was over this door that the Boneshaker cycle was placed. It was now illuminated by little bulbs and established as a local focal point. In Joe's day, it had been at the side of the building. The internal structure was considerable altered and completed with a Terrazzo Floor. The modernisation was complete. Two stories highlight a little of Flo's good work. One day she was working at the premises when a lady arrived in her car requesting that a tyre be changed. Not having the facilities to carry out that task, she advised the lady of local premises, with which, she had contracts. She added that if the lady told them she was Flo's niece, she might get a little discount. Thinking no more about it she carried on with her normal work. Some time later the owner of the tyre premises thanked Flo for her recommendation, saying the woman had liked the prices and service so much, she had had all her tyres changed. To all intent and purposes this was the end of the story for Flo, until one day a large expensive black car pulled up and the driver, a man, requested the tank be filled. After this was completed he told Flo that he was an Haulage Contractor. The lady who had requested the tyre change was his wife. He had never previously sought to get discount for petrol, services or any other items he had used in the course of his business. After hearing of the incident involving his wife he considered if a small petrol station and tyre fitter can give discounts to customers, why couldn't the garages and suppliers give him discount on all the business he gave them. He had subsequently gone on to make such arrangements. His wife had said to him if ever you pass by Flo's filling station, make sure you thank her by filling up your car. He was now following her request. Aston had always been a hard working district. It still had many poor families. Flo became well known for her generosity with local families, who on occasions, had difficulties making ends meet. Many local children benefited from shoes, which she bought and distributed. It would seem that an Esso representative questioned how such a small concern could sell up to 6000 gallons. when other larger Esso garages, with a larger number of staff, could not sell the same quantity He came to look for himself. When asked how it was achieved, Flo pointed out she was part of the local history, she knew everybody, they all knew her. Their troubles were often her troubles. The Human Touch? You tell me! Trade continued to grow until that time came when all the land around that particular part of Aston Road North was identified as being needed to form part of the intended Aston Expressway. Flo's filling station, along with a number of other premises, realised their presence was being consigned to the history books. The premises closed in 1970. After the closure of the filling station Flo went to work as a Domestic in the Maternity Department of Good Hope Hospital. She describes this as the happiest time of her life. She later moved to a similar position at Penns Hall where she stayed for 5 years. Even now she still says she has not yet stopped working as she has too many interests to slow down. 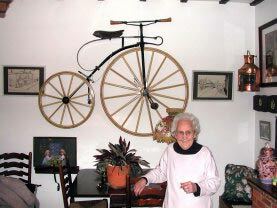 She lives in the North of Birmingham with her husband and is still displaying the same positive attitude, which enabled her to build up the premises for which, the Boneshaker Cycle, became a focal point and maybe an "Icon of Aston", for both locals and those in transit along Aston Road North.